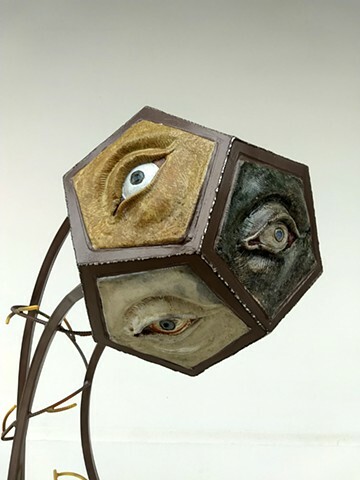 Andy Denton is a sculptor and educator who uses welded metal and ceramics to comment on contemporary spirituality and agnosticism. Many cities across the Southeast and Midwest exhibit Denton's outdoor sculptures and pottery. He has twice been awarded the Regional Artist Project Grant for Pitt County North Carolina. He spent two years as Artist-In-Resident at the Armory Art Center in West Palm Beach, FL, where he taught sculptural welding, made and exhibited his artwork. He managed the visual art building at Interlochen Center for the Arts in Michigan for eight consecutive summers. Now in Little Rock, AR, he manages the large-scale sculpture studio for Maritza and Terry Bean Public-Artwork.com and continues his own practice. Denton earned an BFA from the School of the Art Institute of Chicago and an MFA from East Carolina University. His hobbies include running, music appreciation, and bread baking.